Il faut ABSOLUMENT aller voir l’expo de Peter Doig au MBA. Il y a une peinture extraordinaire d’un homme qui marche avec un parapluie rose. Je pourrais contempler cette toile pendant des heures. La toile est magnifique, et en plus, on peut facilement imaginer l’histoire de cet homme, pauvrement vêtu, qui longe un mur sous le soleil. Tout d’un coup, vous êtes ailleurs. J’y vais bientôt! Notre sortie USk Montreal est au musée dimanche. Je pense que je vais m’absenter du groupe pour un peu de temps ou aller voir l’exposition après le lunch. J’ai très hâte de voir Peter Doig. I know I am going to love the show. Hope to see you Sunday Charles. I spent a long time looking at that painting. I have to say it may be one of my favorites. Something about it reminds me of the Malecón in Havana, maybe the strong light. 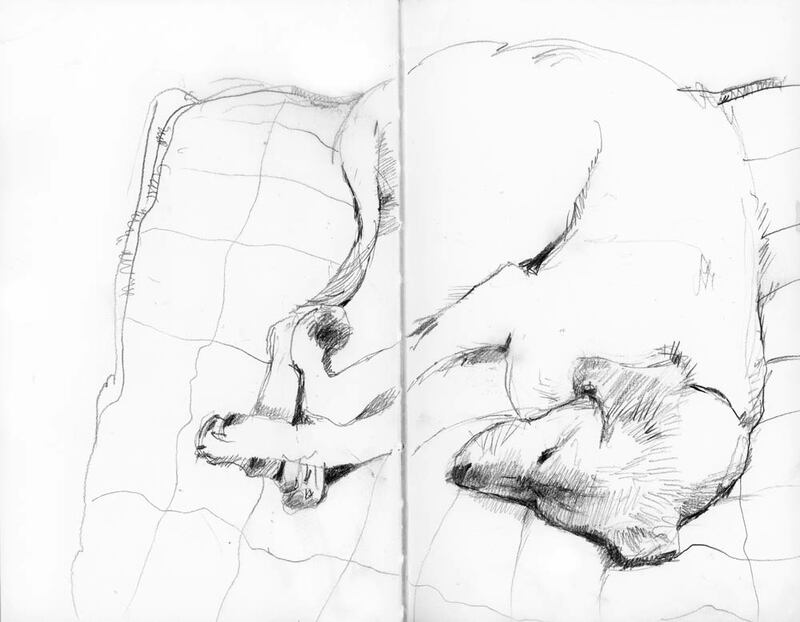 I have not racked my brains for one that evokes such a strong emotional response, but your drawing of Alice reminds me of my old dog, a hungarian viszla who we had for 15 years. Those long slender (foldaway) back legs and the dog duvet, happy tired dog. it evokes happy memories for me indeed. Yes, at that moment she was a happy, tired dog. Probably from doing all that cheering during the game. You should have seen her today when they won the gold medal!! Good question. I have two choices, both of which I’ve been fortunate enough to see in real life: Vermeer’s “The Geographer” (at the Stadel museum in Frankfurt) and Rembrandt’s “Artist in his Studio” (at the Museum of Fine Arts in Boston). “The Geographer” somehow manages to capture the “aha” moment of insight, and “Artist in his Studio” captures that feeling of “this is bigger than me but I can do it”. And as much as I have stared at both, I still don’t know what exactly it is that the artists did technically to make those paintings so powerful. Both unusual paintings Fiona. Both artists I also love to look at. I had never seen “The Geographer”, which is an unusual painiting because usually Vermeer’s models are female. I was quite sad when I was in Amsterdam a few years ago and some of the Vermeers were on loan or being restored. There are so few and I probably won’t be back in Amsterdam any time soon. The Rembrandt is also a very unusual painting and I can see why you find it powerful. Thanks for sharing. I too spent hours at the John Singer Sargent exhibit at the Brooklyn Museum this summer, what a moving experience. His use of watercolour pushes the medium to its edges as well as the viewers to theirs, I was especially taken with his ‘laundry’ paintings. However one artwork that sent me into rapture when I saw it was Rembrandt’s “The Jewish Bride” which was part of a Rembrandt-Caravaggio exhibit at the Rijksmuseum commemorating the 400th anniversary of Rembrandt’s death. I felt like the painting came right off of the canvas to shake all of my senses awake. I saw that painting at the Rijksmuseum too and I agree with you. Is it the intimacy of the gesture? The glow of the fleshtones? It’s a wonderful painting. As for Sargent, I had never seen the laundry paintings in reproductions. They were a wonderful surprise when I was touring the show. I am sorry I didn’t go to Boston in December to see the show again. Who knows when that opportunity will present itself again? Hi Shari — next week I will go with you to visit Peter Doig while we are USKing. I too wish to see him as he seems exquisite. I have heard very good reviews. For your question, I have a few artists that I cannot keep my eyes from their painting. My first event happened when I was very young and I saw, for the first time, Arthur Rackham’s Mother Goose: The Old Nursery Rhumes plates… wow! His lines drawings and his trees are totally wonderful. Years later when I first saw the Lord of the Rings movie, I knew where Jackson’s inspiration came from… from Rackham! My second inspiration happened when I was 19 years old, visiting at the Louvres and seeing “Le Rêve” by Pablo Picasso. I was mesmerized. I just kept looking and looking and looking at it, and by looking at this painting, I learned what Picasso was trying to show or educate us. I then saw it again in NYC at the MOMA museum when they had their big Picasso event, and again, I could not stop looking at it. Picasse was an educator more than a show-off… he wanted to change the way that we see things. My third and fourth inspirations are Andrew Wyeth and John Singer Sargent. Both because of their wonderful use of shadows, colours, aura. Both have very different styles, but to me they are similar in a way… it is their world that they are showing us. rhymes and not rhumes.. funny I am feeling a bit queezy — must have been thinking of rhumes in French — LOL! Thanks for getting me to look up the Rackham “mother goose” illustrations. Knowing that these made such an impression on you gives me some insight into you love of pens and line drawing! We both share a love of Sargent, Wyeth and Fortin. When someone mentions Quebec painting it is his landscapes that come to mind, but for me it is his clouds. in 4 years again, too. Dang. Thanks Tim. We were pretty proud of our teams but four years is a long way off. In the meantime we are happy to have Carey Price in Montreal. Such an interesting question! I love the light in the work by some of the Dutch masters, and also the impressionists, particularly the Australian impressionists (although you probably aren’t familiar with those). But if I am thinking of an emotional response from a particular work, then three come to mind. Firstly Picasso’s “Guernica” (which I have only ever seen as a print) shocked and horrified me which its depiction of the horror and violence resulting from the bombing of the village, Guernica during the Spanish Civil War in the 1930’s. Then there is Andrew Wyeth’s “Christina’s World” (again only seen as a print)… she seems so alone… why is she there… and what is it that she yearning for? And finally, there is a mountain and beach scene in a painting which I bought and which is hanging next to me in my study. The scene doesn’t look like paradise, but whenever I look closely I have this strong feeling of wanting to go there… a bit like the way the Joe Cable character is drawn to Bali Hai in “South Pacific”. So, there you are… strong emotional responses to all of these. Guernica was hanging in New York when I was in university so I have seen it several times before it was returned to Spain. It is remarkable not only for the horror it depicts but also because of its size. It certainly affected me emotionally back then but as an impressionable art student in New York City everything made an impression on me. I have always loved Andrew Wyeth’s work as well and have seen “Christina’s World” many times but it never affected me as much as last year after I read the Wyeth bio by Richard Meryman. The opening chapter is a riveting account of Christina, her brother, the house they live in and their relationship with the painter. If you get a chance to read it you will see the painting in a new light and it may explain what she is yearning for. The rest of the book is interesting too but that I couldn’t put down that first chapter. Nice drawing of Alice napping after all the cheering she did for Canada! I,too, have always loved Sargent,his colors,his brush strokes and looseness. 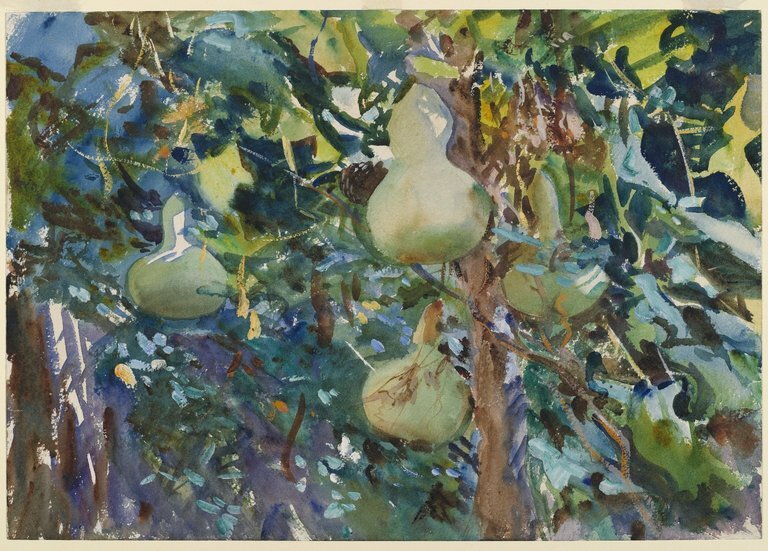 I was thrilled to see his Watercolors in Brooklyn last year and in Boston many years ago. However,one of my favorite paintings is ‘In a Dining Room’ by Berthe Morisot. It features a young woman in the act of some domestic duty with a little dog at her feet. It looks as if she just glanced up to be photographed…except it is a painting. I always wonder what she is thinking. It is in the National Gallery of Art in Washington,DC and I was thrilled to finally see it a few summers ago. I just looked at the painting Linda. Of course the first thing I thought of was “Downton Abbey”! I’ve never seen this Morisot even in reproduction so thanks for sharing. It is a beautiful work, so filled with light. I have really enjoyed reading the responses to this post although it’s taken me some time to respond. Very nice sketch, I like this kind of sketching. Hi Shari, Many years ago at a spring exhibition for amateur artists in Aarhus in Denmark there was a painting by a totally unknown older lady. It was a study over white and red cabbage heads on a field in winter. The strokes were very delicate and the colours were light blue, purple and pink. I fell in love with that painting at first sight. Unfortunately I didn’t have the money to buy it, but I still think of it from time to time and remember the unusual feeling it gave me to look at it. I wish I could see the painting, as I’m sure you do too. It’s amazing that you still think about it. Thanks for sharing! Oh Shari — I forgot to mention one of the most important Québec artists, whom I love dearly — for the magnificence of his artwork. His trees are wonderful too! Marc-Aurèle Fortin!!! Hi Gail. I’m probably not doing any workshops in Montreal this summer. I’ll be out west in July. But of course you can join our Sunday sketching group. The link to USK Montreal is on my sidebar and we always post our outings well in advance. I’d love to see you there! Glad you like Sargent too!